I have bought from you guys before – great company – great products – challenge for you – We are a security video company that installs tons of outside IP video cameras – we cannot stop spiders from building webs on our cameras – we have not been able to find any product that will stop the spiders from building their webs – any ideas? Will buy it now – and if it works – will buy tons of it. Thanks. I have dealt with (and currently deal with it too) this exact problem and use a few treatments that work. That being said, they all work differently, require different followups, etc. so you’ll need to consider how frequently you visit the locations to decide which to employ. Here are your options. The first is to use a spider repellent. Known as WEBOUT, this ready to use liquid spray needs to be applied once a month around the surfaces at the base of the camera mount. So for each camera, you would want to spray the housing, the base and at least a 3 foot circle around the base where it mounts to the structure. Again, this would be needed once a month and you’ll need a good PUMP SPRAYER to make the applications. The small size pictured above will cover around 250 sq/ft and comes with its own sprayer; the gallon sized jug will require a good pump sprayer to apply it. 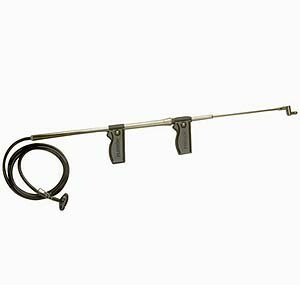 Our sprayer comes with a series of tips that will let you fan spray as well as pin stream up 15+ feet. If you need even more height, the TROMBONE SPRAYER can reach up over 30 feet. Its manually operated and has a long hose you’d drop into the gallon jug of Webout so its completely portable which is handy. The Webout would be what we consider to be the “natural” and “organic” option as it uses nothing but essential oils to repel spiders. This means it won’t kill them but it will work and treatments will last a month so it is a viable option. But if you want something to last longer that will both repel and kill insects that come around, go with a true insecticide. Personally I have several IP cameras mounted on the outside of my home. To control mosquitoes in my yard, I mist blow my landscaping every couple of weeks. 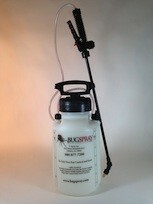 This effectively controls mosquiotes, biting flies, gnats and more. When I treat the yard, I make a point to spray around my cameras at least once a month. Just a quick blast of the area and I’m set. 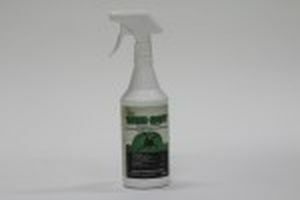 It stops spiders (and other pests) from landing around them and it keeps them running well. I’m using BIFEN. at a rate of 1 oz per gallon of water and it does the job well. So for your need, spraying around the cameras using the Bifen will do the job for sure. Of course, spraying the whole structure would make the most sense since spider webs can “drift” so if you let spiders live within a few feet of the cameras, webbing could find its way over. Like the Webout above, you’ll need a good pump sprayer or the listed Trombone sprayer to make the application. You can also mist it up using one of our machines like the FM6309. This unit will blow the mist 30+ feet up and will pump a gallon of mixed solution every 101-2 minutes making it well suited for fogging the yard, treating the home, etc. 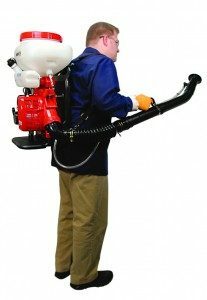 For on going maintenance, especially for large buildings like warehouses, a BACK PACK MIST BLOWER would be a good fit. Again, using any standard PUMP SPRAYER can do the job fine but the Mist Blower will work a lot faster and can reach 40-50 feet up which could be important based on camera locations. And being that these units are gas powered, you’d be complete independent without the need for electricity. The last option would be well suited if your goal is to do something that will last 3-4 months without having to visit. We’ve had customers install AEROSOL MACHINES on structures just behind cameras and then use the machines to release a pyrethrin based space spray which spiders hate. Basically they’ll avoid where the spray is active (of if they get too close, they’ll die) and one machine with METERED INSECTICIDE can last 4+ months. That means you should be able to set up a machine, put some batteries in it, add a refill, turn it on and forget it for long time. I’m thinking if you’re not able to get to the cameras on a regular basis, this might be the best option. Now if you believe the aerosol machine will be a good fit, the AERO 2000 is well suited for the task. The Aero 2000 has a timer that allows you to set it for release every 5, 15 or 30 minutes. It also has a photo cell so you can tell it go off at night (when its dark) only. Night time activation every 30 minutes is the ideal setting for controlling spiders because this is when 99% of all spiders are active. When set to go off every 30 minutes when its dark, the refill will last 120+ days. So depending on where you service cameras, you will only need to change the refills 2-3 times a year. Use the METERED INSECTICIDE in these placements. Its quite strong and will keep all insects away.